The coastal town of Paphos with its medieval fort and quaint harbor is harmonious combination of historical sites, tourist resort and wonderful countryside. It is a region where it combines mountainous areas and the sea. It harmoniously joins culture, contemporary life and historic archaeological sites. The Maa-Paleokastro site near Coral Bay holds an admirable view. It is where the Mycenaean Greeks first landed in Cyprus during the Bronze Age. Travel further inland and go on a wine village tour, make sure to visit the Chrysorrogiatissa Monastery and admire its beautiful icons, and, taste the wine there- the Monastery produces wine from its own winery. Enjoy any of the numerous activities on offer in the Paphos district, from sea sports, golf, diving, swimming, snorkeling, visit traditional villages- especially round the Polis area whilst sampling the long standing Cyprus cuisine and being charmed by the traditional architecture of the houses, explore the countryside, check out the water park, go carting; the list goes on. The Akamas peninsula is a nationally protected area of untamed wilderness with awe-inspiring coastlines and sandy bays. Take in the panoramic views from the top. One of the last nesting grounds in the Mediterannean Sea for the Green-Back and Loggerhead turtles is located here; on Lara Beach. Walk on one of the numerous nature trails and explore the rare endemic plants and spot different migratory birds. A thoroughly memorable experience would be a boat trip along the awesome coastline which includes the famous Aphrodite’s Rock. Paphos is now included in the list of quality coastal destinations of Europe and visitors can combine a relaxing, but also safe holidays, tradition and culture, nature and clean seas. The island’s capital for six centuries, Paphos (Pafos) is like an open-air museum. It is so rich in treasures that the whole town has been put on UNESCO’s World Heritage list. An area with more than 50 km of coast, in the district open to the public, and more than 12 blue flag awarded beaches, making, Paphos a place perfect for swimming, diving or snorkelling all year round. If you prefer the charm of a quiet rural environment to the hustle and bustle of a tourist resort you can choose to stay in a traditional village house in accommodation known in Cyprus as “Agrotourism”. It is the perfect place to combine first class holidays with a walk through history. Immerse yourself in the archaeology, history and culture of Paphos and experience at first hand one of the oldest civisations of the world. 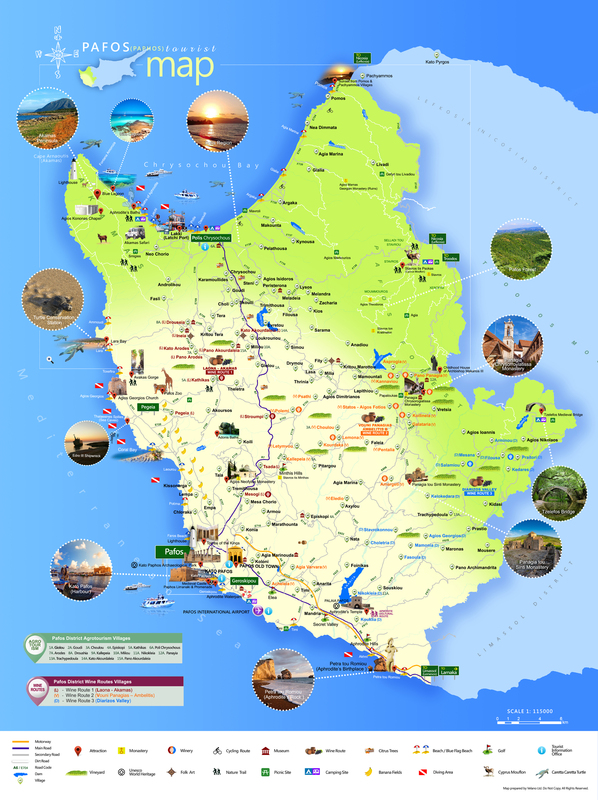 Where is Paphos located? Discover all the best places to visit in Paphos. 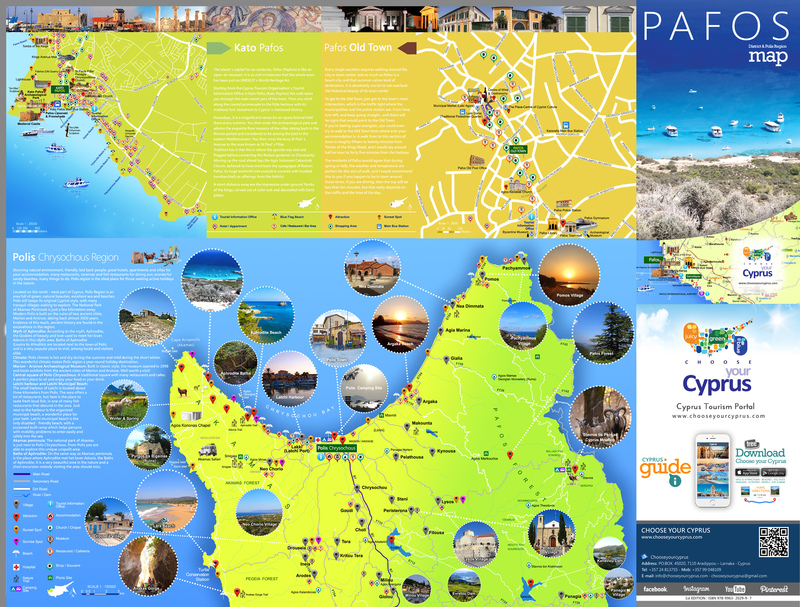 Explore now the maps of Paphos and Polis region and be ready to live the adventure at Aphrodite's birthplace. From luxury beach hotels and resorts for chic city and spa breaks, to holiday villages and authentic back-to-basics family-run establishments, you’ll find quality accommodation in Paphos to suit your every whim. Just 300 m from Chloraka Beach in Paphos, Meltemi offers elegantly decorated villas with balcony overlooking the Mediterranean Sea. Surrounded by a lush garden, the villas feature their own private pool and a sun terrace with sun loungers. Free Wi-Fi is offered throughout. Enjoy shopping in the pleasant, modern environment of ALPHAMEGA Hypermarkets and benefit from extraordinary low prices, a wide selection of local and imported products and quality excellence service. ALPHAMEGA Hypermarkets are inspired by their consumers, supporting, respecting and standing by them to satisfy their every need and requirement. Visit one of the eleven ALPHAMEGA Hypermarkets today and enjoy a unique shopping experience.